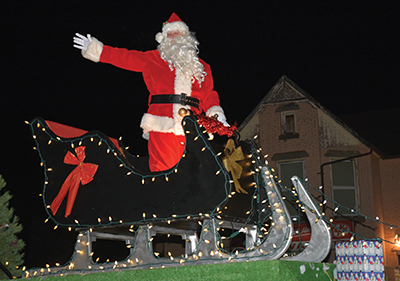 Dust off your Santa hats and get your letters ready, because the Kin Club’s Santa Claus Parade is coming to town! For over 40 years, the Kinsmen and Kinettes have been running the parade and collecting food for the food bank, and have recently merged to create the Kin Club. Everyone is very excited to create this event once again. This year, there should be approximately 45 floats in the parade, with different school groups, businesses, non-profit organizations and sports clubs getting involved. There is a lot of variety between the floats, and it is an event for everyone to come out and enjoy. There will be firefighters collecting non-perishable food items for the Orangeville food bank during the parade, so be sure to bring some donations for them. Canada Post will also be collecting everyone’s letters to Santa, and delivering them to the North Pole. This year, they have chosen Narinder Singh, who owns Call A Limo here in Orangeville, and on weekends Narinder provides free shuttle service for ‘Orangeville against drunk driving’ to keep drunk drivers off our roads. This is an amazing privilege for him, and we are happy to have him in our community. Starting at 5 p.m. this upcoming Saturday, the Canada 150-themed parade will make its way from Hansen Boulevard and First Street to Rotary Park. The floats will be showing what their interpretation of what 150 Canadian Christmases looked like. Be sure to come out with your Canadian pride, and don’t forget your Santa hats.